* Supergroup Jazz Attack ft. Peter White, Rick Braun and Euge Groove (USA). * the exciting new music experience of Tumi Mogorosi and Project ELO. The festival, popularly known as “Africa’s Grandest Gathering”, boasts multiple stages with over 40 artists performing over two nights and is set to host more than 37 000 music lovers. 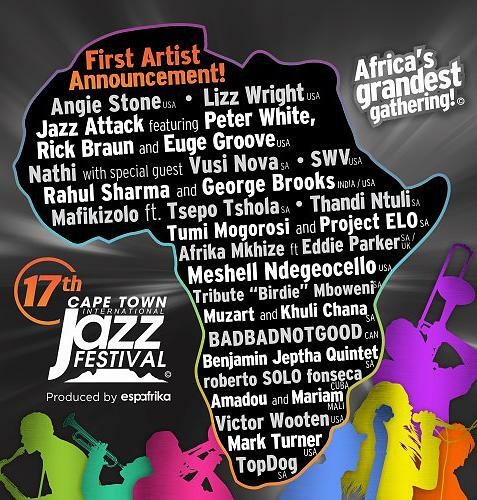 Cape Town mayor Patricia De Lille said: “The Cape Town International Jazz Festival has become an institution which breaks down barriers and gives us the opportunity to celebrate our shared love of music, together. In anticipation of next year’s festival Arts and Culture Minister Nathi Mthethwa said: “Jazz is a means with which we tell our stories. We believe that events like the Cape Town International Jazz Festival, where the living legends of jazz rub shoulders with younger local artists, play an important role in providing for a cross pollination of knowledge, skills and talents. The CTIJF 2016 second artist announcement will be released on the November 24, but tickets for the festival go on sale on Tuesday at Computicket. Ticket prices are as follows: R895 for a weekend pass (two days) and R590 for a day pass. Limited Rosies Stage tickets cost R30 per performance and will be available on www.computicket.com from December 7.